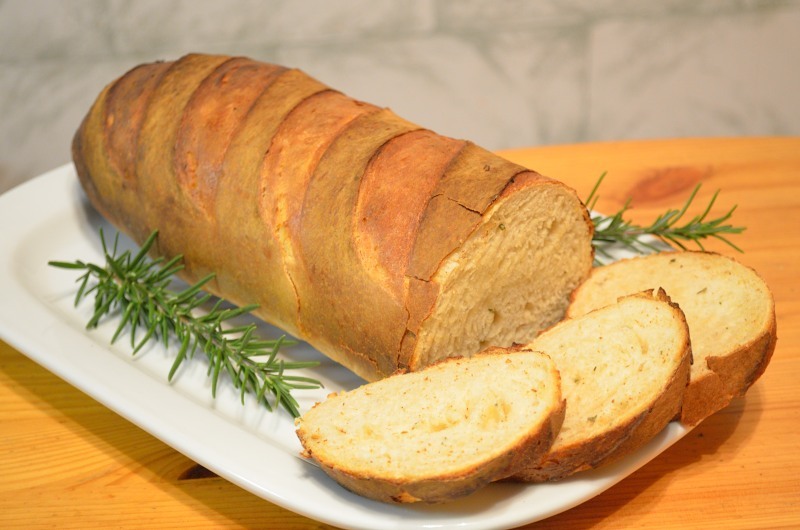 I'm reposting my October Bread Challenge entry here as an artisan bread recipe. 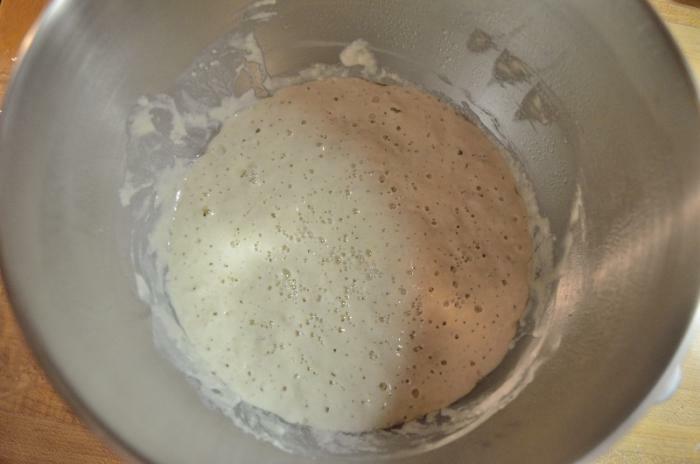 I also just posted how to make the yeast starter in this same forum (http://www.kamadoguru.com/topic/15812-sourdough-yeast-starter/). 1) The day before, pull your yeast starter from the fridge, feed it, and let it warm/build up. 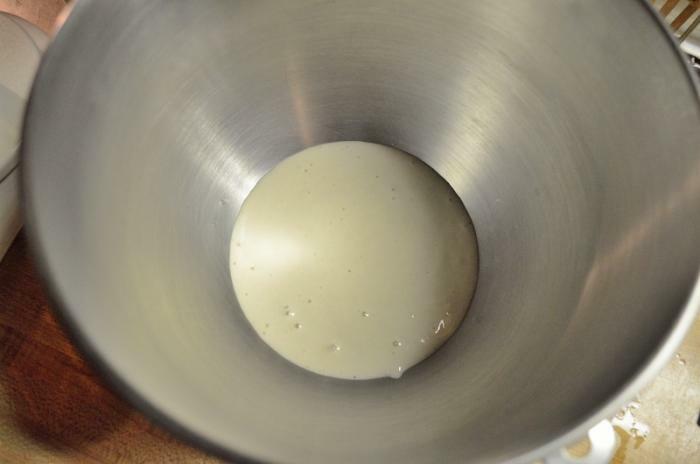 2) The night before, make a sponge starter. Add 5 oz (wt) Bread Flour, 1 cup yeast starter, and about 2-3 oz water to bowl and mix well. The sponge should have wet medium consistency. Add water/four as necessary. 3) Next morning, the sponge should be ready. 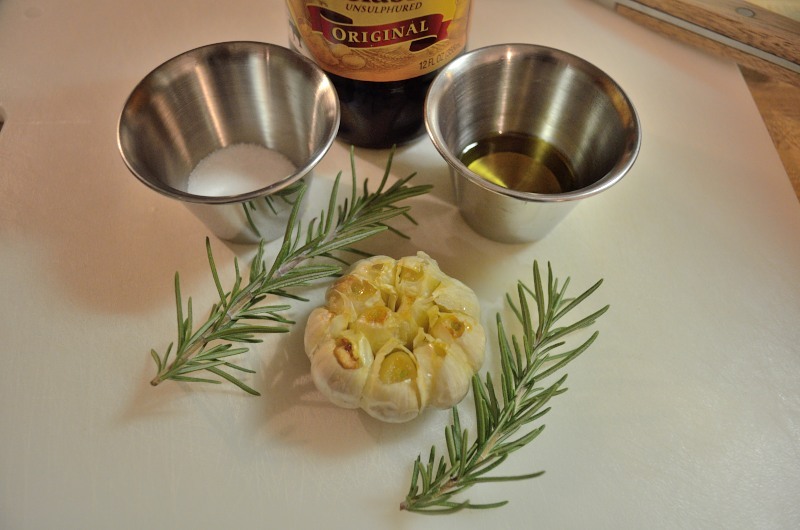 4) Roast the garlic, let it cool and squeeze out the soft aromatic cloves into the bowl with the rest of the ingredients. 5) Mix and knead on stand mixer with dough hook for 10 minutes. 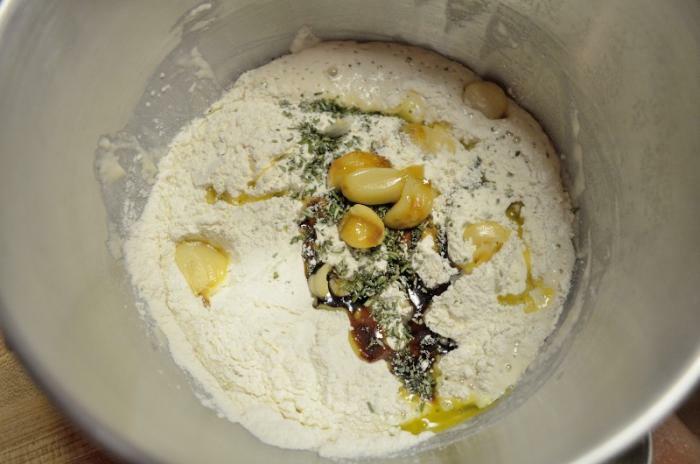 Add flour or water as necessary to achive a dough ball that doesn't stick to the bowl. 6) Form into round ball and place in oiled bowl. Cover. 7) Let rise all day. Punch down a couple times if necessary. 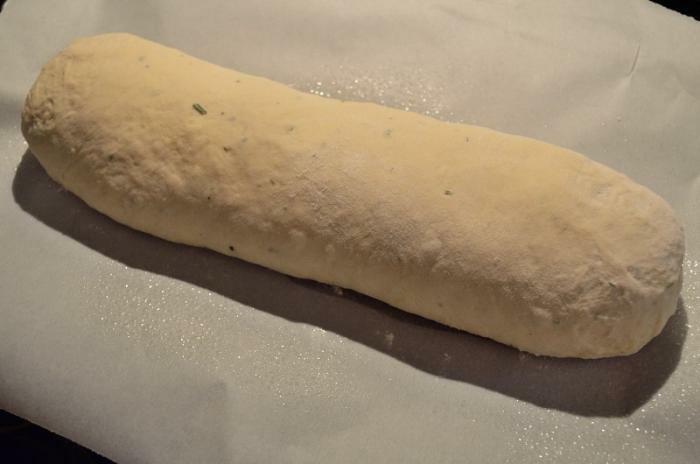 8) Form into desired shape (a baguette loaf this time). 9) Let rise until doublish in size. In the meantime, fire up the kamado indirectly to about 450 deg F. Cut diagonal breaks in the top of the loaf and spritz with water spray bottle. 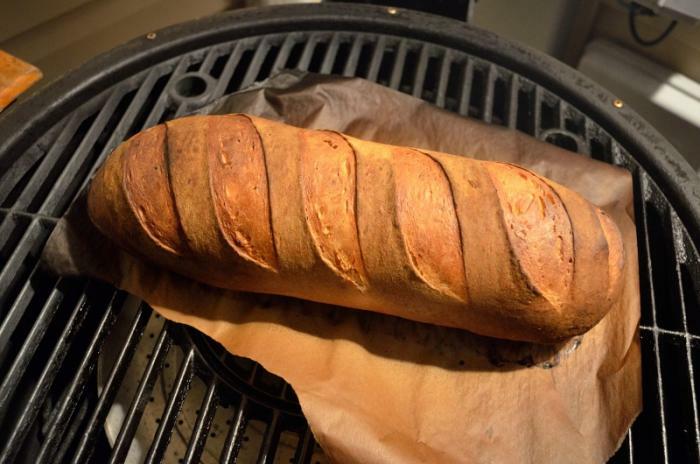 10) Place loaf on kamado. Cook for 25-30 minutes or until done. Remove and let cool. 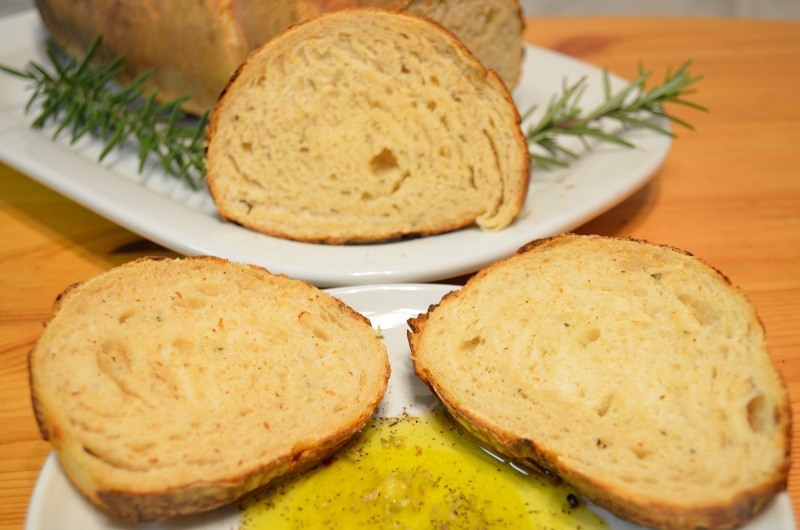 11) Slice it up and serve with sauce of olive oil, parmesan, oregano, and black pepper. 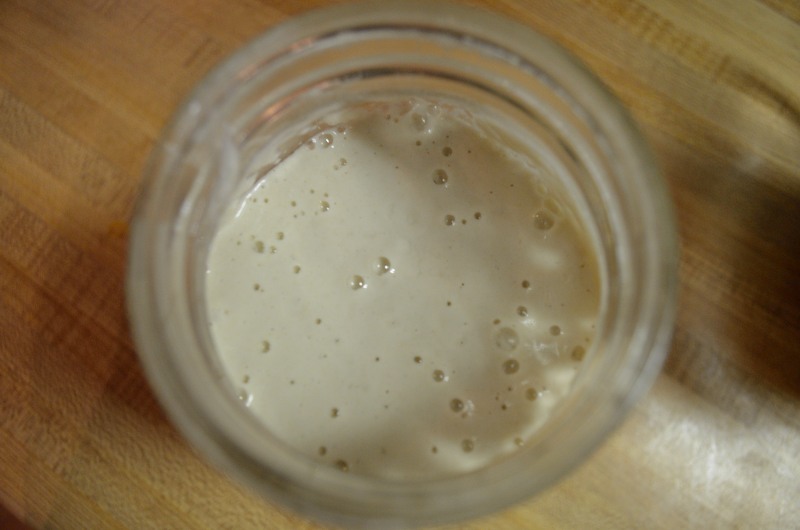 I also just posted how to make the yeast starter in this same forum. Larry, I'd like to keep both of these in the recipe section... could you post the ingredients and instruction lists with each? Sure, John. Just did it. So looks like you cook it on paper? That looks terrific. I am trying to figure out how I can make this with the overnight artisan method. I roast garlic all the time and have it in the freezer. Parchment paper and only long enough for the crust to set then I removed it for the rest of the cook. I do this with pizzas on the grill too. 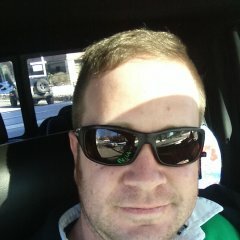 What's the artisan method, and how does it differ from my yeast starter to sponge starter to full loaf method? The artisan method I am talking about is no starter but the 5 minute flour water salt and yeast. Mix all together with water and leave 8 hours to overnight on the counter. 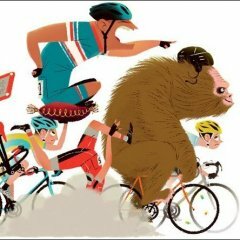 I will try your method when I can get my rear in gear. I just tried this recipe and it had wonderful flavor!! I think I missed a little on the rise though. It was slightly denser than I expected. After pulling from the mixer bowl, I just let it rise all a day ~8 hours. It had doubled already. After forming into a loaf it rose some more. Should I have formed the loaf earlier? Or should I have let rise after forming loaf longer? I am new to bread baking... 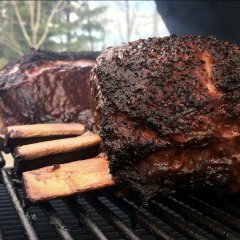 This recipe is actually one of the inspirations for giving it a shot :-) Thank you for sharing @BEER-N-BBQ by Larry !! Also, I assumed the 5 oz wt of bread flour for the starter was part of the 15 oz total. Was that right? Yes. Part of the total. 2. The year ran out of food. The initial rise may have went too long. Should be double in size before reforming. 3. Didn't sit long enough to rise. 4. Oven temp is too low. The first ten minutes of baking at least should be at least 450 deg. 5. The skin set before it could rise fully in The oven. Cause:. The oven was too dry. Next time spray some water in the oven initially and at the five minute point to keep steam in the oven long enough to prong the outside firming up. It had been doubled for several hours before I formed the loaf, and probably sat for another 45 min - 1 hr, while the grill came up to temp. It did expand some after forming but I guess it was a mix of 2 and 3 you mentioned. I'll try again soon and keep an eye on 4 and 5 too. My very first attempt at bread was from a box. I did want it to be easy and quick as I felt I was dipping my toe into the baking water. So here is the box we used. 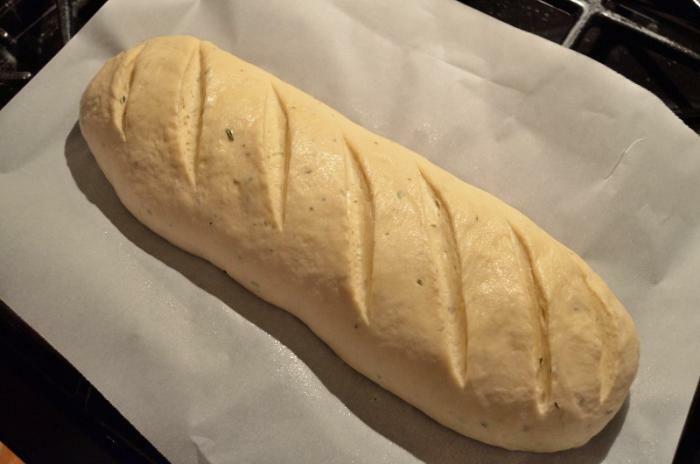 Very easy to make just add water and let it rise for 45 minutes to an hour. Put it on a greased pizza pan on the top rack, I wish I had thrown it on a sheet of parchment. I did get some light sticking to pan when I checked it at the 20 minute mark. This is how it looked pulled after 30 minutes. Served it up with some homemade Scottish cabbage stew that the misses made last night. If you've never had, it is wonderful and very easy to make also it comes from a local restaurant(we know a lady who used to work there). I can post the recipe if anyone is interested. It's basically cabbage, carrots hot sausage and chicken stock topped up with cheese and served with(you guessed it) a big ole hunk of bread! Here's the dinner pick. My wife also put together a peach cobbler that she asked if it could be grilled as well, to which I replied; I'll give it a shot! Peaches, cinnamon, a dash of nutmeg, butter, brown sugar, and rolled oats. Mix cinnamon and nutmeg with peaches until well coated. Put them into pan. Slice a stick of butter into 1'' pads and put on top of peaches. Sprinkle an even coating of brown sugar to cover all peaches, then oats on top to cover. Put into grill at 400f and take off when browned on top. Pretty sure you could use any fruit in the world and it would turn out amazing. We have also done the same recipe but added bourbon into the fruit, this is awesome as well. Finished! Awesome and easy! May try a more challenging bread recipe soon. Cooked a brisket for our Church Brunch (Roasted chicken, brisket, candied sweet potatoes, green beans, mac & cheese). Started it 9pm and wrapped it in butcher paper the last hour to get it off by 9am. Granted this is an extremely horrible brisket pic but, after two long shifts and basically no sleep, I was incapable of properly operating a camera. I did discover that I can basically cook a brisket sleepwalking however. The technique I used here was to make a poolish from 75g of the overall flour and 100g of the overall water. Instead of just a pinch of active dry yeast, I used 15g of my sourdough starter instead. I mixed that up and let it do it's magic overnight for 12 hours. 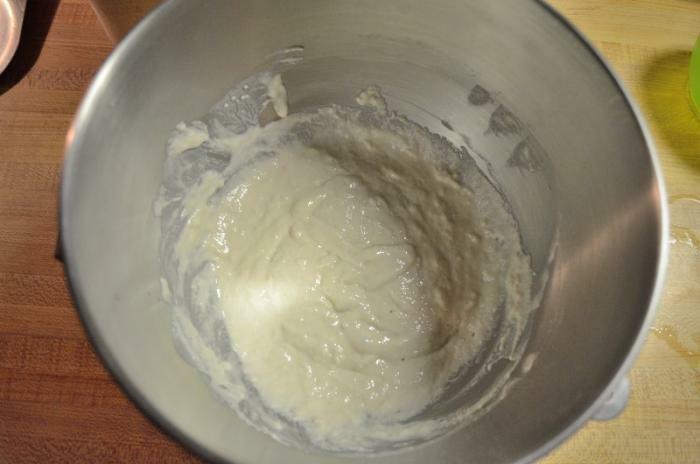 Today, I combined that poolish with the rest of the water at 95 degrees the mixed in the rest of the ingredients and let the dough hook knead it for 10 minutes. 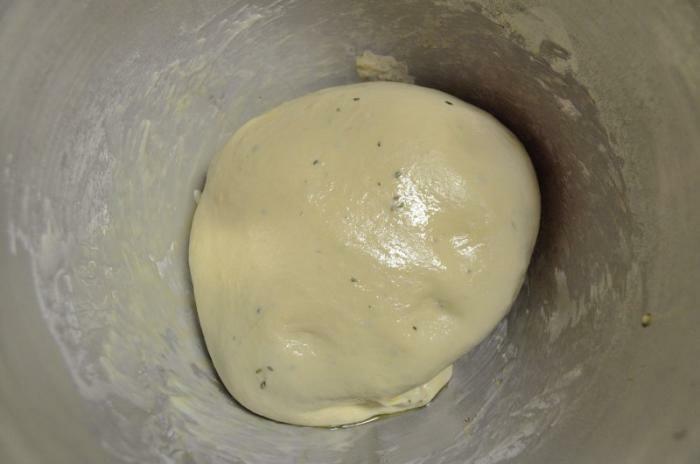 I shaped that into a dough ball and let it rise covered in a greased bowl for 90 minutes. I took that out and shaped it into my cast iron loaf pan. I let that rise for another 30 mintues. Hey guys, I posted this over the recipes forum a day or two ago, because it was the first forum on bread I could find using Tapatalk. I then realized it was the wrong place for it, so I'm reposting here. A friend of mine bought Ken Forkish's book "Flour Water Salt Yeast" a little while ago, and after borrowing it for a short span I bought my own copy, and have had a blast baking bread following Ken's instructions. I've tried a lot his recipes and have started making a few of my own creations using the techniques he teaches. However, whether I follow a recipe or go freestyle, something as beautiful as the first image always comes out black on the bottom. I get mixed results in both the KJ and Akorn. I think the best way I've found for baking in the KJ is with th deflector stones in place directly over the coals. Only trouble with that is I have a hard time getting to and maintaining 475 degrees, especially with a ginormous Dutch oven in there. I can get my Akorn to temp REAL fast, and then put the heat difuser in and let things simmer down, but the bottom always comes out scorched. Again, only time I seem to get burning is when I use the Dutch oven. Sad.